Have you ever wondered how a computer works? The answer to that is code. Code tells a computer what to do. On my blog, I have used code to create the Angry Birds cursor that you are using right now, and many other things. Coding lets you go beyond what is already of a computer. Now, if you create a blog, you don't have to code it. Blogger is free, and it looks fine the way it already is. But, if you want to make it better, you can go into your blog's code. For those of you that like to do that, Blogger lets you edit your blog's code to make it the way you want it to be, not the way other people think it should be. It lets you be creative. 1. To edit your blog's code, go to your blog's template and click on edit HTML. 2. Always have a backup copy of your blog's original HTML. Coding is a very delicate thing. One wrong space, and you can delete your entire blog or mess it up. Before you go editing your blog's code, copy+paste it onto a document, so if you mess up, you can always have a original copy of your blog's template HTML. 3. Look for >head< in your HTML. Click on the big text box full of code, them use the keyboard shortcut ctrl+f then type in whatever it is that you are trying to find. If you copy+paste code from a internet source, it will ask you to find a certain phrase from your blog's code and paste it somewhere near it. 4. Never copy+paste any code onto your blog if you don't what it does. You may end up changing the blog in a way that you didn't want to change it. 5. Make sure that the code that you are pasting onto your blog comes from a dependable source. It may be a virus or even worse, an embarrassing cat video at the top of your screen. Oh, the horror! 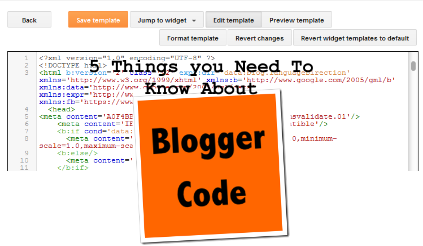 And those are 5 things you need to know about HTML coding with Blogger. Be sure to like, subscribe, and stay tuned to more on This and That, Here and There. Bye!